A common form of an Explanatory/Analytical study is a case control study. 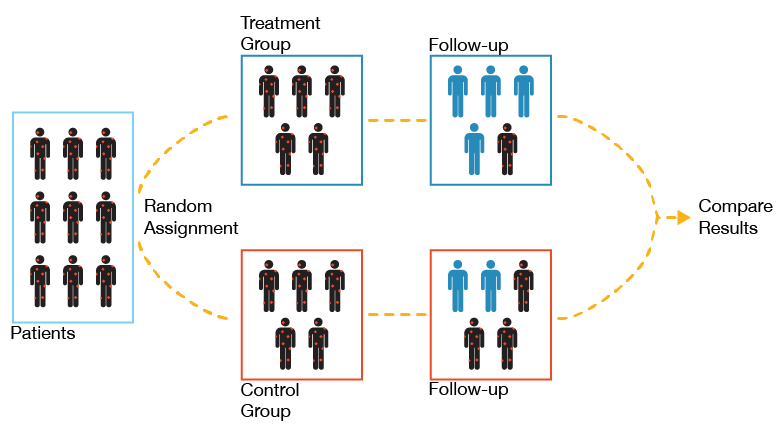 The diagram below displays a classic case control study during which a researcher who wants to test the effect of a particular medicine on an illness will design a study in which a group of patients is divided into two groups – one group will receive the treatment while another group receives a placebo (control). The patients will be followed and their health outcomes will be compared to see if the treatment course resulted in a lessening or elimination of the illness in the treated group as compared to the untreated group. An example of a classic case control study. There are also quasi-experimental studies, such as uncontrolled before and after studies. Uncontrolled before and after studies measure the situation before and after the introduction of an intervention in the same study site(s) and any observed differences in performance are assumed to be due to the intervention. For example, a reseacher may aim to test whether a book reading club in a retirment home reduces feelings of loneliness and isolation among elderly residents. In a quasi-experimental study, the research would use an accepted research tool (i.e. a loneliness survey) to measure feelings of loneliness and isolation among a group of residents and then implement the book reading club for some period of time. After the defined period of time has passed, the researcher would administer the same accepted research tool to the same group of residents a second time and compare the results of the pre-club survey to the post-club survey to measure any change in the levels or loneliness and isolation experienced among the group of elderly residents. Any changes would be ascribed to the implementation of the reading club. Uncontrolled before and after studies are relatively simple to conduct and for the purpose of attributing causation are considered superior to observational studies; however, they may have intrinsic weaknesses as evaluative designs, as other trends or sudden changes make it difficult to attribute observed changes to the intervention. For example, in the case of the book club described above, a reduction in feelings of loneliness and isolation could be the result of another phenomonon, like weekly arts and crafts sessions, introduced into the elderly resident population. Without a control group, it is difficult to determine if the positive benefit experienced by the elderly residents is as a result of the book club, the arts and crafts sessions, or some other unknown factor. Furthermore, in such studies the intervention is confounded by the Hawthorne effect – which is an effect sometimes experienced by participants in research projects in which they experience a positive or beneficial outcome simply as a result of participating in a research project. This effect could lead to an overestimate of the effectiveness of an intervention. That being said, because of the ease with which before and after studies can be implemented, they are often a good study type for graduate level research. Please find an overview of the strengths and limiations of various study types in the following.